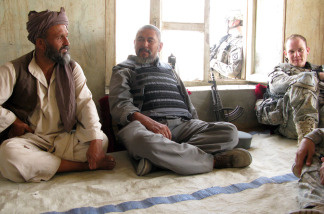 U.S. Army 1st Lt. Mike Kehoe (right) sits down for a chat with a village elder and the local police chief in Ali Abad, Kunduz. U.S. troops are responding, deploying to the north and working with Afghan forces in areas previously thought to be free of Taliban influence. Violence in southern Afghanistan, heartland of the Taliban, is expected. But some of the new U.S. troops surging into the country this year are being sent north, to areas previously thought to be free of Taliban influence. The province of Kunduz, in northeast Afghanistan bordering Tajikistan, isn't supposed to be Taliban territory. But at a police checkpoint in the Ali Abad district in southern Kunduz, only a winding river separates insurgents from government forces. Zukrullah, a junior officer in the Afghan national police, says he's sure the Taliban are watching his men. "Actually, the enemy is back that side of the river. They are 50 [people], and we are like five people," Zukrullah says, speaking in his native Dari. Those aren't very good odds, but Zukrullah has some backup at the moment, in the form of a few dozen U.S. infantrymen visiting his lonesome outpost near the village of Puli Kheshti. Zukrullah says the Americans have been teaching the police useful tactics -- he just wishes there were more police here to fight off the Taliban. The American soldiers are on foot patrol in the village for the first time, but they're planning to make it a habit. A few kilometers up the road, they've set up a field headquarters where they'll spend most nights sleeping and eating alongside the Afghan police station. They get better information working alongside Afghans, and it allows for better training of Afghan police, who are supposed to take over security so the U.S. forces can leave. But all that wasn't even supposed to be needed in the north, especially because ethnic Pashtuns, the traditional supporters of the Taliban, are in the minority in this part of the country. "As the Taliban have been getting stronger, they've managed to infiltrate both Pashtun communities and non-Pashtun communities in the north," says Kate Clark, a researcher with the Afghan Analysts Network in Kabul. She says German NATO forces in the north have made a weak showing over the past eight years. Afghan government corruption and abuse has made the north fertile ground for the insurgents, Clark says. "Afghan national police were sent in; they robbed people. There were accusations that they'd been dealing dishonorably with local women -- exactly the sort of things that will drive the insurgency," Clark says. The U.S. troops deployed to the north this spring are aware that their Afghan partners were not always a boon. Six weeks ago, in Ali Abad, the police chief was transferred out -- unofficially for corruption, officials say. The new chief is much better, says 1st Lt. Mike Kehoe, a platoon leader with the 1-87th Infantry Regiment of the 10th Mountain Division. "We're down here embedding with them. I like to tell the ANP [Afghan national police] that they don't work for me, I ... work for them. If the chief wants to do something, we try within our best to do it," Kehoe says. Kehoe is confident that the counterinsurgency strategy is already working in Kunduz. He says that when his men push out into the villages, they're able to correct some popular misconceptions. "We came across some locals that came by early in the morning to feed their livestock. They were visibly nervous and visibly scared. ... They said, 'You're Americans, you're going to kill us all. That's what we were told.' I said, 'No, we're not going to kill you, we're here to help you guys,' " Kehoe says. Kehoe says it is encounters like these that change minds about Americans and the Afghan government. But he admits that Kunduz is only now getting the attention it should have had in order to prevent the Taliban from taking hold in the first place. "A lot of people see our weapons and think that we're here to fight," Kehoe says. "We're not. We're here to help the people of Afghanistan." Kehoe sits down for his first meeting with a village elder in Puli Kheshti, offering to use U.S. military funds to build new wells for the village. It is another aspect of the American counterinsurgency strategy -- to use money as soft power to win over the population. The elder seems skeptical, but walks with Kehoe to show him where the well should be dug. It is a first step, but only time will tell if it comes in time to turn back the Taliban in the north. Aid workers killed in Afghanistan - what motivates volunteers to take such risks?